In last week's Tamriel Infinium, I had my top-tier theorycrafter and friend Calls1gn throw together some off-the-wall DPS builds for The Elder Scrolls Online. But he could theorycraft all day, and it wouldn't mean anything if he couldn't put it into practice. Luckily, ZeniMax opened the doors to the ESO beta again this past weekend. I was totally intrigued by the melee Sorcerer with pets. After playing that type of character at low levels, I have to say that it's an extremely lazy class. Now, I didn't have all the abilities because they required a higher-level character, but even at my low level, I mostly sat back and watched my pets do their thing while I found one mob to beat on. It worked and was more than viable. Of course, building a DPS class is easy, right? What about something that requires a bit more concentration? What about a tank or a healer? Building a DPS character is a bit less difficult than tanks or healers, but that doesn't make them any less difficult to play. Still, your playstyle does change, and your focus changes if you want to tank or heal. I asked Calls1gn to build us a few tank and healer classes, too. I wanted a Dragonknight healer because there are few DK abilities that have anything to do with healing, and I wanted a Sorc tank because -- well, just because. He delivered. 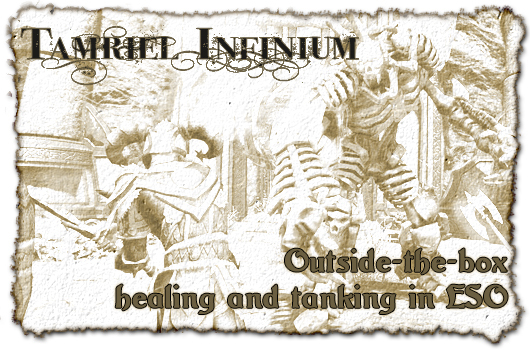 Tamriel Infinium: Outside the box healing and tanking in The Elder Scrolls Online originally appeared on Massively on Tue, 04 Mar 2014 12:00:00 EST. Please see our terms for use of feeds.